The Archaeological Institute of America is proud to offer the Cotsen Excavation Grant Program, made possible through the generosity of Mr. Lloyd E. Cotsen. This program provides two grants per year of up to $25,000 each. We recently featured the work of Justin Leidwanger, winner of the grant for first time project directors. 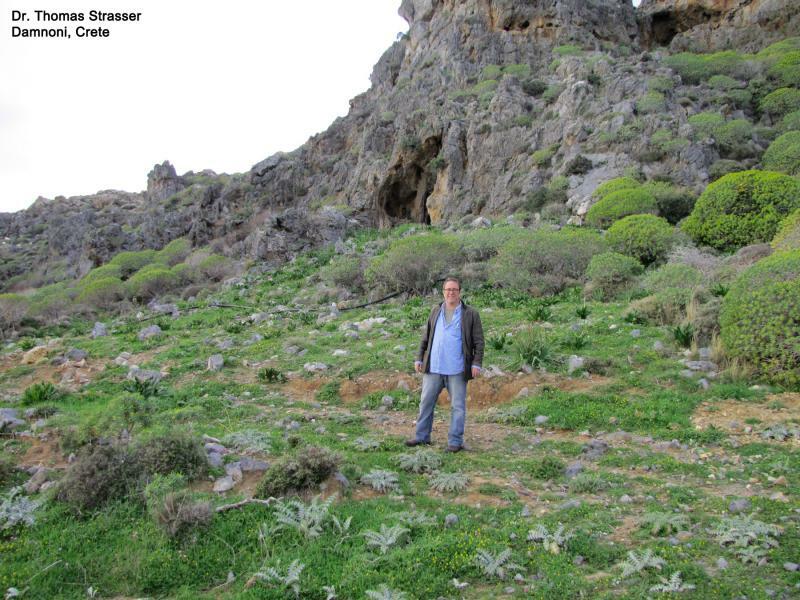 The second Cotsen grant is intended for “mid-career” project directors, and the 2013 winner of this grant was Prof. Thomas Strasser, for his work at the Mesolithic site of Damnoni on Crete. Thomas began college at Duquesne University thinking that he would study law. However, after traveling to Greece and Italy, and taking an archaeology course his senior year, he decided that was the path he wished to pursue. He went on to receive his M.A. from Loyola University, and his Ph.D. from Indiana University. At Indiana, he was inspired by the work of the popular Karen D. Vitelli, Professor Emerita of Anthropology. Thomas has done extensive fieldwork in Greece and Turkey. From the start of his archaeological career, Thomas has been interested in the spread of farming from the Near East to Europe during the Neolithic Period. The question of how animals were transported led to his research interests in seafaring and to his more than 20 years of working on Crete. It is obvious that farming had to be imported to the island, but there are no known extant boats and many questions. The Plakias Stone Age Project began in 2008 as a Greek/American collaboration, providing research funding for projects around the village of Plakias in southwest Crete. There has been work on Neolithic sites on Crete, yet based on evidence from other Aegean Islands, Thomas and his team believed they could locate pre-Neolithic artifacts, evidence of a previously unknown civilization. It was near this village of Plakias that researchers found the oldest tools yet discovered on Crete, and both Mesolithic and Lower Palaeolithic sites. Damnoni is a Mesolithic site where excavations began in 2011. The stratigraphy of the site was revealed in this first season, while the goals of the 2013 season funded by the Cotsen Grant “were to learn the size of the site and to understand better the nature of the artifactual assemblage.” Thomas reports that both goals were accomplished. The grant specifically allowed for the training of many students, who helped dig 64 1m. x 1m. trenches. The team discovered a great variety of stratified Mesolithic remains. In situ was lithic material, including obsidian, the earliest discovery of its kind on Crete. These unusual materials point to an advanced trade network between islands. The discoveries at Damnoni will guide future excavations plans for other sites on the island. Thomas has been a member of the AIA for over 30 years and is part of the National Lecture Program. He knew the name of Lloyd Cotsen and applied for funding from the Cotsen Excavation Grant Program once he heard about the opportunity from the AIA. At the AIA’s 2014 Annual Meeting held in Chicago, a poster on prelimary research at Plakias was presented, and won the Best Poster Award. A PDF of this wonderful poster is available through the Plakias Stone Age Project. A report on the Damnoni excavation is available in the Spring 2012 issue of ákoue: The Newsletter of the American School of Classical Studies at Athens. A write up of the excavation is also available in the Fall 2014 issue of the INSTAP-SCEC Kentro Newsletter. Further reports on these discoveries are in the works, as a great deal of scientific analysis is currently taking place. The AIA wishes the Plakias Stone Age Project the very best of luck with future excavations and research. The discovery of these Mesolithic and earlier sites rewrites the timeline of Crete, and one can expect to hear of future groundbreaking finds from Thomas and his team. Further information about the AIA’s Cotsen Excavation Grant Program, and the application, can be found here, or by contacting the Director of Programs, Ben Thomas at bthomas@archaeological.org. Applications for 2014 have closed. The next deadline is November 1, 2015. If you would like to support archaeologists like Thomas with a generous gift to grants and endowments at the Archaeological Institute of America, click here now. If you are a professional archaeologist or graduate student in archaeology, and current member of the AIA, who would like to be featured on the AIA website, please contact Emily Maskas at 617.353.8703 or emaskas@aia.bu.edu. Through the AmazonSmile program, Amazon will donate 0.5% of the price of your eligible purchases to the Archaeological Institute of America. Click here to learn more and to register.